Tour Old Car City USA in White, Georgia and you may wonder if it is a junkyard at all. 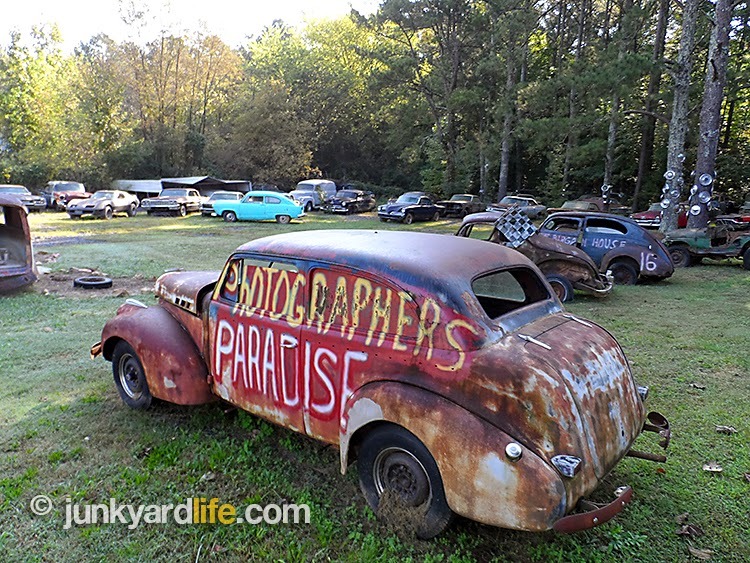 Touted as "The World’s Largest Junkyard," this gear head destination is located 50 miles north of Atlanta. The Junkyard Life crew, consisting of, Jody Potter, Ron Kidd and Anthony Powell, found ourselves, in a rush to witness the spectacle first-hand. With only 2 hours until closing time, we forked over the entry fee and set out on a mad dash to see if this was the world’s largest junkyard or an outdoor museum of American automotive history. The three-legged dog, known as Junkyard Life, toured Dean Lewis' legendary 35-acre, wooded playground of rusty relics in 2012. We found muscle cars, hot rods and classic cars along the 6-mile trail. Also, signs, bicycles, piles of parts and hubcaps could be found everywhere. A big question loomed. Is anything for sale? “Everything is for sale,” said owner, Dean Lewis. We quickly realized that his prices would be hefty. Breaking up a part of Dean’s automotive collection meant spending several thousand dollars. $3,000-$5,000 seemed to be the normal price for Old Car City’s junkyard jewels. A tough sell when your looking at what appear to be parts cars, at best. Viewing miles of rarely seen American iron in massive waves was satisfying. I only wished we had more time to linger. Several complete, restorable cars were also for sale near the front office. Those prices were higher, as you would imagine. I can’t blame him. One man’s junk is Dean’s treasure. Watch the video, above, and help us look for the diamonds in the rough before they get any rougher. 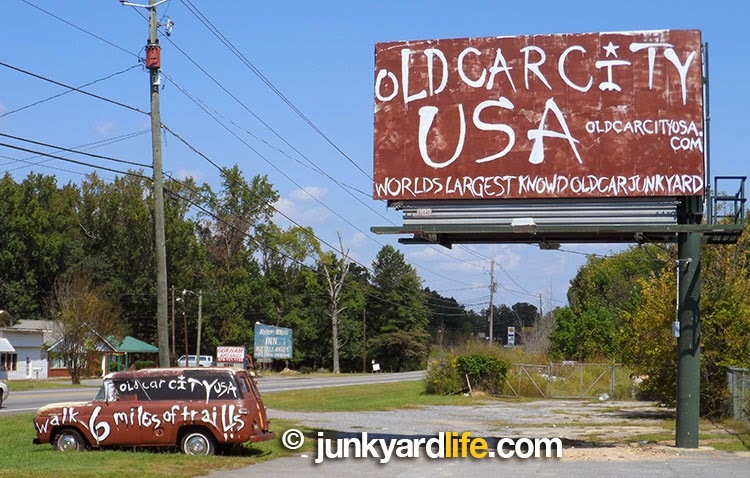 Also, stay tuned for more photos, video from Old Car City U.S.A.
A giant billboard pitches Old Car City U.S.A. to passing motorists. 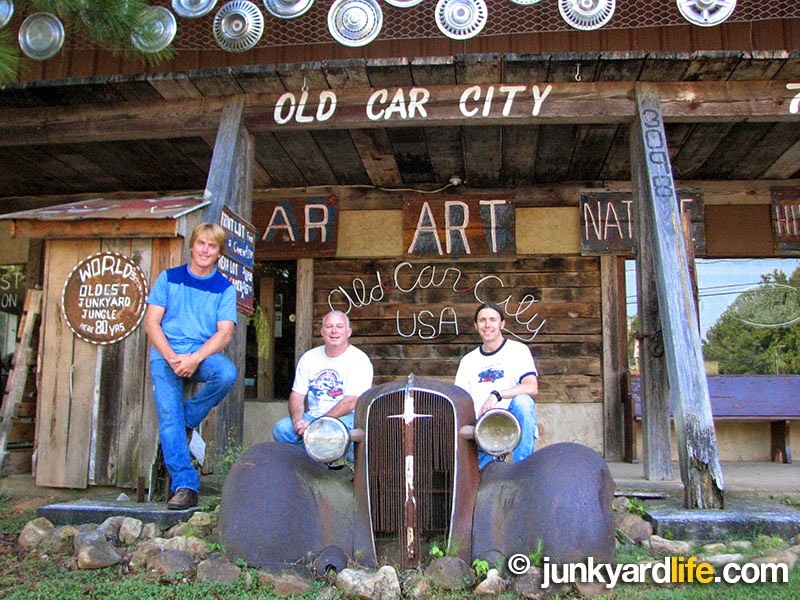 Anthony Powell, Ron Kidd, and Jody Potter take in the sights at Old Car City U.S.A. in White, Georgia.